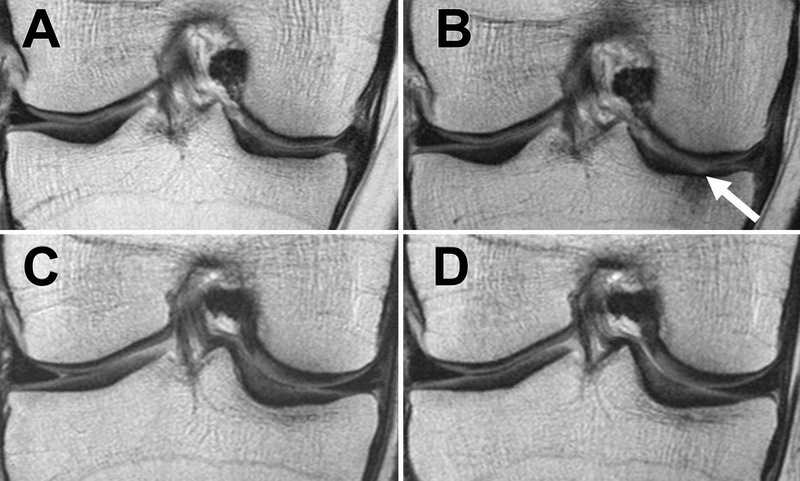 MRIs of the right knee obtained with the coronal proton density-weighted fast spin-echo fat-suppression sequence at, A, C, baseline and, B, D, after 48 months. Patients were an obese 65-year-old woman with stable weight and mild knee pain (A and B) and an obese 64-year-old woman with weight loss over 48 months and mild knee pain (approximately 10.9 percent decrease in BMI). According to the National Institutes of Health, obesity is a risk factor for osteoarthritis. Being overweight or obese can place extra pressure on joints and cartilage, causing them to wear away. In addition, people with more body fat may have higher blood levels of substances that cause inflammation in the joints, raising the risk for osteoarthritis. The research team investigated the association between weight loss and the progression of cartilage changes on MRI over a 48-month period in 640 overweight and obese patients (minimum body mass index [BMI] 25 kg/m2) who had risk factors for osteoarthritis or MRI evidence of mild to moderate osteoarthritis. Data was collected from the Osteoarthritis Initiative, a nationwide research study focused on the prevention and treatment of knee osteoarthritis. Patients were categorized into three groups: those who lost more than 10 percent of their body weight, those who lost five to 10 percent of their body weight, and a control group whose weight remained stable. The results showed that patients with 5 percent weight loss had lower rates of cartilage degeneration when compared with stable weight participants. In those with 10 percent weight loss, cartilage degeneration slowed even more. Not only did the researchers find that weight loss slowed articular cartilage degeneration, they also saw changes in the menisci. Menisci are crescent-shaped fibrocartilage pads that protect and cushion the joint. “The most exciting finding of our research was that not only did we see slower degeneration in the articular cartilage, we saw that the menisci degenerated a lot slower in overweight and obese individuals who lost more than 5 percent of their body weight, and that the effects were strongest in overweight individuals and in individuals with substantial weight loss,” Dr. Gersing said. Light to moderate exercise is also recommended to protect against cartilage degeneration in the knee. “Our study emphasizes the importance of individualized therapy strategies and lifestyle interventions in order to prevent structural knee joint degeneration as early as possible in obese and overweight patients at risk for osteoarthritis or with symptomatic osteoarthritis,” Dr. Gersing said. This entry was posted in Articles, Injury, Knee, Prevention, Treatment by sportsmedicineweekly. Bookmark the permalink.